Right-click on the desktop or another folder and select New > Text Document. Rename it to emptyrecyclebin.bat. Make sure the file has the .bat extension and not .bat.txt. Test the file once to make sure it works. Type gpedit.msc and select the result to load the Group Policy Editor. Use the Browse option to pick the emptyrecyclebin.bat that you created previously. Windows will execute the script (to delete Recycle Bin content) when Windows shuts down automatically from that moment on. You can use the same process to delete the script again if you don't want to use it anymore. Type in the address bar shell:startup. This should open the startup folder. Microsoft's Windows 10 operating system comes with a new feature called Storage Sense; you may configure it to delete Recycle Bin content, and other temporary files, regularly and automatically. 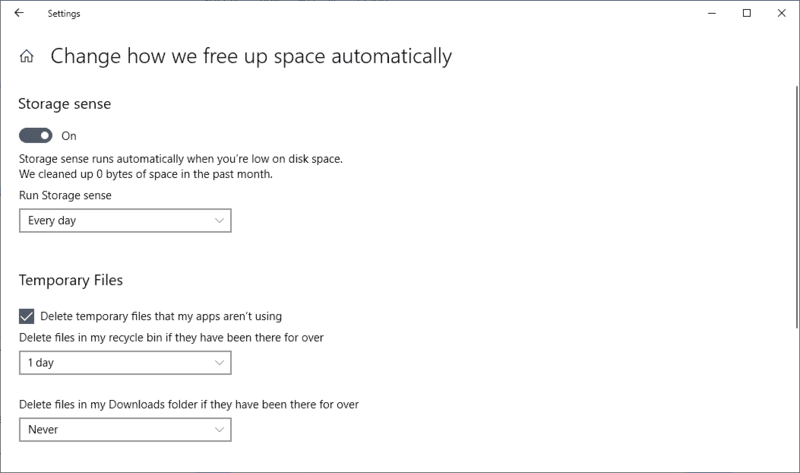 Select "Change how we free up space automatically" on the Storage page. Toggle Storage sense to "On". Set a desired period for the feature, e.g. every day, week, month, or on low disk space. Check "Delete temporary files that my apps aren't using". Set the desired period that deleted files need to sit in the Recycle Bin untouched before Windows deletes the files. The default period is 30 days, you may change that to 1, 14 or 60 days (or never). If you don't want files in the download folder to be deleted automatically, make sure that setting is set to "never". Windows will from that moment on delete files in the Recycle Bin if the time they have been in the recycle bin untouched exceeds the selected period. Find out how to delete files that are in the Recycle Bin on Windows machines automatically on shutdown or on start of the system. This a nice article Martin, been looking for something like this for years. I would like to clear the TEMP folder when computer shuts down. that can not become a problem anymore. No i use a shortcut to a batchfile, to shut down the computer. I just created a 2GB ramdrive (B:) and set my user varible to use a temp folder there. Then I created a task to run at the logon that creates the folders I need on B:. I’ve also edited my FF config to locate the cache in that location as well. If you manually control all updates and don’t mind changing the system varibles back and forth when needed you can also set the system varible to use this location and temporarily set it to a non volatile location for any updates that require temporary files to exist on boot. I could be wrong, but didn’t you write a post about RAMDisk and Firefox portable? All the rest follows from this. About the Recycle Bin… Maybe is possible use a junction link instead the script. Do people shutdown their PCs? I do so only if updates force me, otherwise I let it sleep. I’ve seen people who even just let it run and don’t even sleep it. I deliberately use the recycle bin, by not hitting shift+delete, as that bypasses it. Then the size of the recycle bin is set to a sensible size and it doesn’t bother me if stuff in there sits for a month. I never shut down my PC. My PC is running tasks 24/7. I don’t understand the need for an auto emptying recycle bin. Just right click the icon and select ’empty recycle bin’. How hard can it be ? @Ivan: Do people shutdown their PCs? I shut down my work PC every evening. It’s required by my employer for security reasons. Right click–Properties–Don’t Move Files to the Recycle Bin; remove files immediately. Still a feature from XP days that is on Windows 10 Pro, all versions. Never has changed. Yes, this is what I’ve been doing since forever. I strongly dislike the recycle bin. Yup, same here, ha.. I stopped using the recycle bin many years ago. I’m just aware, and don’t delete stuff by mistake, at least yet. Thus I save time by not having to fuss with the recycle bin. Also, I know how to recover deleted files if need be, which is a hassle, but overall the better choice for me. Nice tip, Martin. Thank you. Clear-RecycleBin does not work on win8.1 (powershell 4.0). It is easy enough to obtain Powershell 5 or 6 for Windows 8.1. I have done it, and have tested Martin’s solution with Powershell Core 6.2. It works well. Good. But to do this with cmd, whats is the right command to put in the .bat file? Roll over effect in that the icon will show trash; click–all is gone. gpedit isn’t in Windows Home versions. I have a few bat file shortcuts on the desktop to flush dns, delete email cache, chromium cache, etc. and click them when needed. Only issue I’ve had is something, AV, Win Security Center, not sure what, deleted them; resetting File Security fixed that. How hard is it drag recycle bin to desktop, then right click/delete recycle bin contents? You do have to look at the icon, then move a finger but really? Sarcasm aside, this is a good intro to startup and shutdown files and how to write them. Find all the junk chrome won’t delete on shutdown and clear that too! 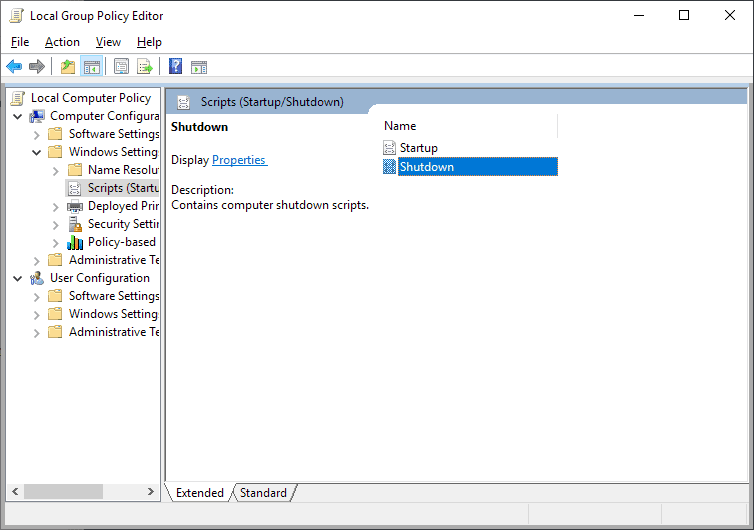 The bat file works if I click on it manually but if added via Group Policy to run at shutdown it does not execute. I have 2 user accounts, could it be I need to specify which one needs the Recycle Bin cleared? does not work for them it has to do with permissions and elevated privileges (which I found out the hard way after much fiddling and head scratching). Hope this helps anyone who was struggling to get this to work.